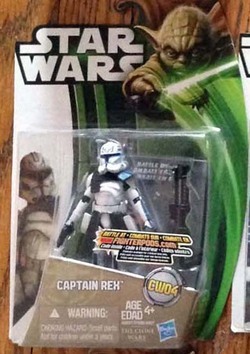 A MOC Hasbro STAR WARS - CLONE WARS action figure of Captain Rex (2013). Very low distribution occurred for this entire wave of figures and as such are very difficult to find. Buyer pays shipping and handling. Discounted shipping for multiple items. Visit our e-store for lots more Star Wars items! All items are from a non-smoking environment. Click on the photos to see larger detail. We have shipped to over 5,000 customers in 3 dozen countries. Our handling fee is modest and covers the cost of insurance, Canada Post costs, and the extremely careful packing of this item. By purchasing this item you are agreeing to the stated shipping cost and are willing to leave a 5-star rating on shipping. We happily combine shipping. Wait for us to send a combined invoice before paying. Non-Canadian shipments will reflect value on the outside of the box. This may incur customs and other fees paid by the buyer and result in delivery delay. As required by law, we are unable to mark values down on non-U.S. shipments. Non-U.S./Canada shipments may take up to 8 weeks to be delivered if held by customs.